Like it or not, fat is an essential part of our diet. Franklin Becker, author of Good Fat Cooking, provides 100 mouthwatering recipes to incorporate fat into your diet in a healthy way. Becker focuses on "good" fats like olive oil or those found naturally in avocados, fish and nuts. 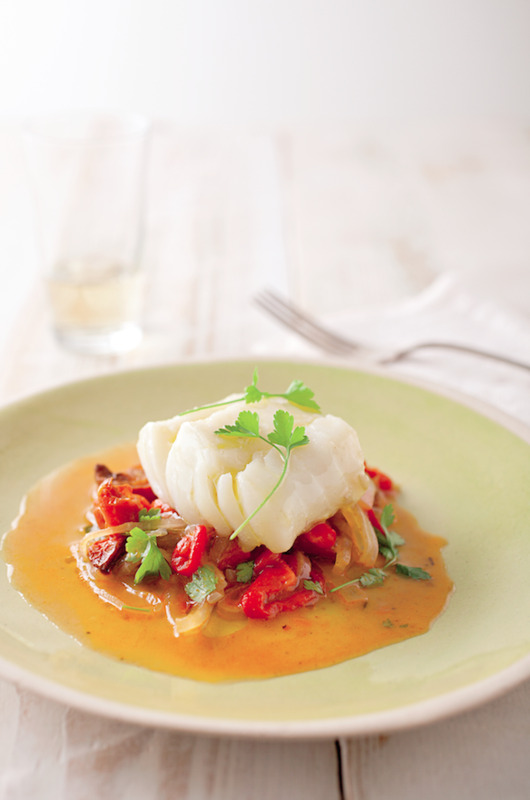 Dishes like olive oil poached cod if a flavorful fat packed meal that you can feel good about. Poaching fish in oil lends to a moist and tender filet that is difficult to achieve by any other cooking method. To offset the richness of the fish, it is is paired with roasted tomatoes and peppers which add acidity to keep the dish balanced. You can also poach salmon or halibut using this method. Did you ever wonder why Mediterranean cuisine features so much cod when there is not a cod to be found between Gibraltar and the coast of Lebanon? Intrepid sailors in the late Middle Ages found the seemingly endless supply of cod off the coast of north America, and it became a staple of Mediterranean cuisine. Usually it is used in its dried, salted form, but I found that gently poaching cod in fresh olive oil and serving it with a stew of tomatoes and peppers produces a fish with delicate textures and a less salty, "fishy" flavor. Don't be concerned about the amount of olive oil I use here. You can always fry a few potatoes in it, which will remove any impurities and fishy taste, and then store it in the fridge to reuse for any recipe that calls for cooking in olive oil. Cod is endangered in many areas, particularly in New England. Ask your fish source where it came from and if it's sustainable. To brine the cod: In a large pot, combine the warm water with the salt, stir until dissolved, and chill. Submerge the fish in the brine and let sit for 30 minutes. to make the tomatoes: Preheat the oven to 450°F. Line a baking sheet with parchment paper. In a medium bowl, combine the tomatoes with the olive oil, vinegar, thyme, garlic, sea salt, and black pepper and toss to coat. Arrange in a single layer on the baking sheet and roast until the tomatoes are charred and the skins slip off easily, 20 to 25 minutes. Remove the skins and toss the tomatoes with the parsley. Set aside. To make the peppers: In a medium skillet over medium-high heat, warm the olive oil until hot. Add the peppers and cook, stirring frequently, until they get some color, about 5 minutes. Add the onion and cook, stirring frequently, until the onion and peppers are tender, about 25 minutes. Season with salt and black pepper. Add to the tomato mixture and toss. To assemble the cod: Remove the cod from the brine and pat dry. In a large pot, combine the olive oil, lemon zest, thyme, and garlic and heat to 120°F on a kitchen thermometer. Working in batches, gently slide the fish into the pot so that it is covered entirely with the oil; if not, baste frequently. Poach the fish until just cooked through, 20 to 25 minutes. Arrange a filet on each of 4 plates, spoon the tomato mixture over, and drizzle with olive oil. 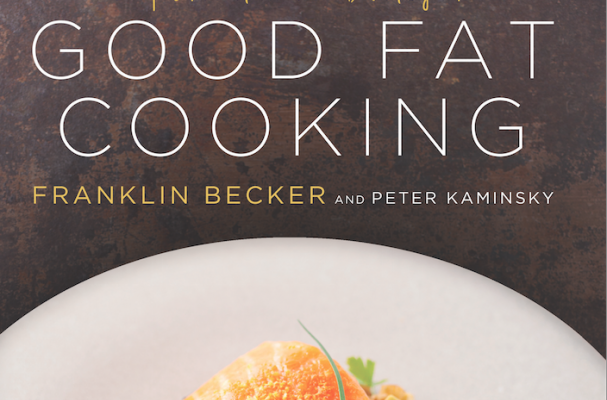 Reprinted from “Good Fat Cooking” by Franklin Becker and Peter Kaminsky. Copyright (c) 2014 by Franklin Becker. By permission of Rodale Books. Available wherever books are sold.